Have you ever bought something and put it to the back of the cupboard, and kept telling youself that you will use it, at some point.....? I've had the tasty-fill pan (who comes up with these names?) from Wilton for a couple of years but never gotten around to using it, partly because the instruction leaflet didn't make a huge amount of sense to me. The recipe leaflet leaves a lot to be desired, suggesting that you use a boxed cake mix, and frozen Cool Whip or similar for the filling - which is something we don't have in the UK. I also wasn't sure I fully understood the instructions for how to assemble the cake. Luckily there are now plenty of bloggers who have used this tin and explain the process, so I finally decided to take the plunge, and am very glad I did. It's not difficult at all, and the result is very impressive. I made this for a work colleague's engagement and birthday and I had people coming up to me all day asking how I had made the cake and saying how good it was. And this is the wrong way. Got it? I used the recipe for Nigella's Old Fashioned Chocolate Cake which you will find if you follow the link. I ended up having to make a double quantity of the recipe as the cake tins are very deep - in fact this is the tallest cake I've ever made. It's also worth mentioning that I think chocolate cake works best here. You really don't want to see where the two layers of cake join, and if you make a vanilla sponge, the edges of the cake will most likely be more browned so there will be a line going through the middle of the cake. Chocolate cake means that you won't see the join. You need to grease both tins really well and get right into the grooves or the heart shape won't work. I used PME cake release spray. Fill both tins evenly with the mixture and then bake in the oven. Allow the cakes to cool in the tin then turn out onto a baking rack. Hopefully they will come out clean; any bits of cake that break off or are stuck in the tin mean there is a high chance of the heart shape not working. Mine turned out fine as you can see. Make sure you remember which half of the cake is the top and which is the bottom. To fill the cakes, first place the bottom half on a cake board and secure with a little buttercream. I didn't want to take any chances as this was the first time I had made this cake, so I made a simple pink buttercream. 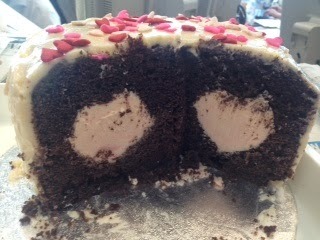 Spread the buttercream in the circular gaps around the cake, pressing in and levelling off the top. Do that on both halves of the cake. Carefully invert the top cake and place on the bottom layer. You can see what I meant earlier about the join - if you had a vanilla sponge which browned more at the edges, as they often do, you would have a distinctive line. I also levelled off the top of this cake so it was flat. I covered the cake in a cream cheese frosting which I added a little pink food colouring to, and sprinkled some heart-shaped sprinkles, also from Wilton, over the top. Ta da! I don't know how this works exactly - the rings on the cake tins don't look in the slightest as if they would match up to make a heart shape, but they do. 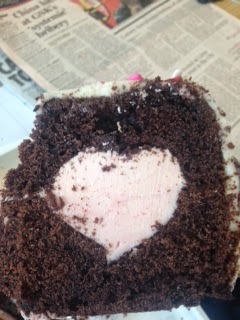 When you cut the cake, every single slice has a heart shape - which is why I used pink buttercream - in the middle. It's so much easier than it looks and would be the perfect cake for an engagement, wedding, Valentine's day or simply the one you love. It may be slightly tenuous but I am sending my engagement cake (well, my colleague's engagement cake) to Alphabakes, the blog challenge I co-host with Ros of The More Than Occasional Baker, as the letter this month is E.
I'm also sending this to Food 'n' Flix, the blog challenge that picks a movie each month and asks bloggers to make a dish inspired by the film. This time Evelyne at Cheap Ethnic Eatz has chosen Bridesmaids. I saw the film about a year ago and wasn't sure I would particularly enjoy it as I'd heard it described as "the female equivalent of The Hangover" - and I don't really like the Hangover trilogy. I did find Bridesmaids quite funny but it was a bit slapstick in places for my taste - but it was a very successful film. It centres around Annie, a single woman in her 30s with a failed baking business, who is asked to be chief bridesmaid for her friend Lillian. The other bridesmaids are like chalk and cheese and get into quite a few scrapes before the wedding - including getting food poisoning from a Brazilian restaurant. I did think about making a Brazilian dish to tie in with the film but the connection with a food poisoning scene just somehow didn't do it for me. Instead, I decided to focus on the love story in the film - of course it all ends happily for Annie, who falls in love and even starts baking again. When I realised that a colleague at work had recently become engaged - and so would be having a wedding, complete with bridesmaids - I decided that this cake would work for this month's challenge! I'm also sharing this with Calendar Cakes, hosted by Rachel at Dollybakes, as her theme this month is bank holiday bakes and cakes to share with friends. OHEMGEE! I was reading through the post going "but where is the heart? When does she put the heart in?" Genius. 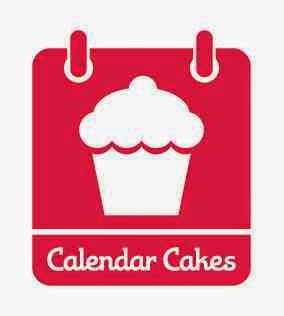 If I had one of these tins, every cake I baked would look like this! Caroline, this is too cool. I have seen this tin and I was so curious to see it in action. Great submission for this month. And glad you liked the movie, minus the slap-stick. Such a brilliant cake, I'm sure everyone was impressed when you cut into it. I saw the same pan when I was in America but didn't buy it, I think I will have to now as it looks amazing. Thanks for entering AlphaBakes. really clever. hope it tasted as good as it looks. Cool tin! I always wondered how you get pretty shapes in cakes! I have never seen this type of pan so thanks for the tutorial. That recipe sounds delicious. Love Nigella! G'day Caroline ...great cake and post for Evelyne's hosting of Food 'n Flix movie challenge this month! What a cool cake tin! And the cake looks really yummy, too!